The view from the bar in Crabby Joe’s. It should make honorable mention just for being a location to have a’ beer with a view’! 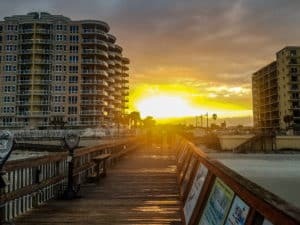 We recently spent 8 days in the Daytona Beach area along the Atlantic Ocean shore in east Florida. It was breathtaking. During our time there I celebrated my 50th birthday. YEP… half a century! So in my own mind I asked “how do I celebrate when I am already living the dream, traveling the country with the love of my life”? I answered myself “….Me & G.R. plus real food & beers from great local restaurants in sight of the ocean, of course”! Before I go any further, I feel the need to start this post with a humble confession. Even Chef’s fall into food slumps. This was not a creative or cooking slump though – but it was an ordering slump! Historically when we dine out, I tend to know ‘just what to order’. G.R. typically looks longingly at my plate & often says “I should have gotten that/listened to you” After all of these of years cooking & working in the industry you just develop the ‘sense’ & learn to read the nuances of the menu, the ‘speak’ of the servers etc… BUT the past month(ish) I have been “off” … like weirdly so! I won’t go into every misstep (I do have some pride at stake here) but suffice it to say that sitting by the ocean one afternoon recently, I ordered chicken wings. You know, buffalo wings with celery. Don’t get me wrong, I love a good wing —> at the right place & time. This was neither. And G.R. deftly ordered a yummy (locally caught) Shrimp & Grits dish. It’s become a joke the past week for him to ask if I want wings when we go to a raw bar or local place … but then, just as it started, it stopped! I got my groove back in Daytona, Florida! The first two restaurants are from my actual birthday … lunch & dinner but they are listed in reverse order because even on a day with good Thai, Millie’s earned the top billing- by far! 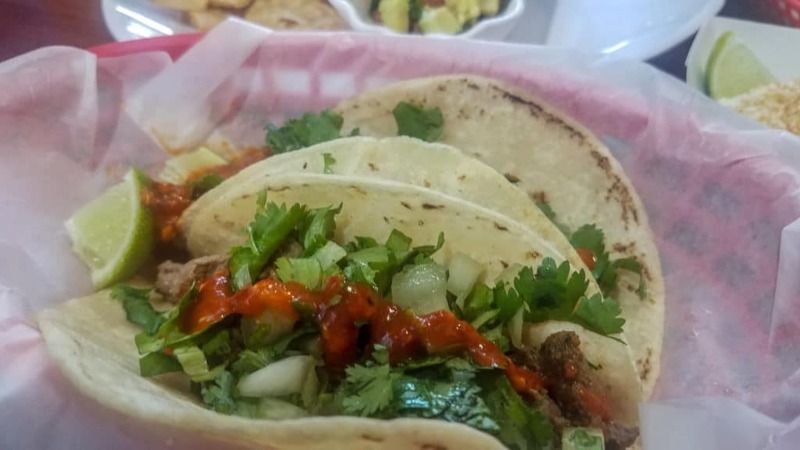 Tia Cori’s taco joint was two days later after visiting the local Farmer’s Market. 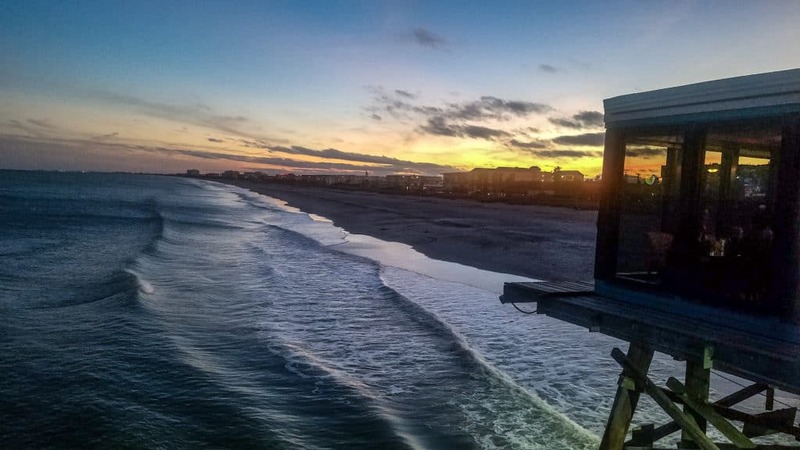 We will be back in Daytona next weekend & needless to say I am looking forward to the beach … and the food!! After all, Daytona broke busted my slump! **This song was one of my son Alex’s favorite. We played it at his Memorial. I was with him when he listened to it last, looking at the mountains in Montana, only weeks before he died in August of 2016 at age 21. Just as IZ, Alex was a tenor & had a similar quality to his voice… Rainbows have appeared to me more in the past 2 years than ever before in my life. Rainbows & music …Mom loves you Alex! Millie’s Restaurant was the choice for my birthday dinner. We walked in & as the door closed behind us we were greeted by a warm smile, a quaint, inviting atmosphere & the song “Somewhere Over the Rainbow” by Israel Kamakawiwo’ole** started to play as if on queue. With (instant) tears in our eyes, G.R. & I exchanged a bitter-sweet smile & I nodded with a small chuckle – & thought “Thanks Alex, Mom had been waiting for your ‘Happy Birthday’ all day … never doubted he would come … he always does! He always helps me celebrate the joy in life. As I smiled through the (almost falling) tears the were welled in my eyes, G.R. gave me an extra squeeze, & we sat at the bar to have a pre-dinner beer while they got our table ready. 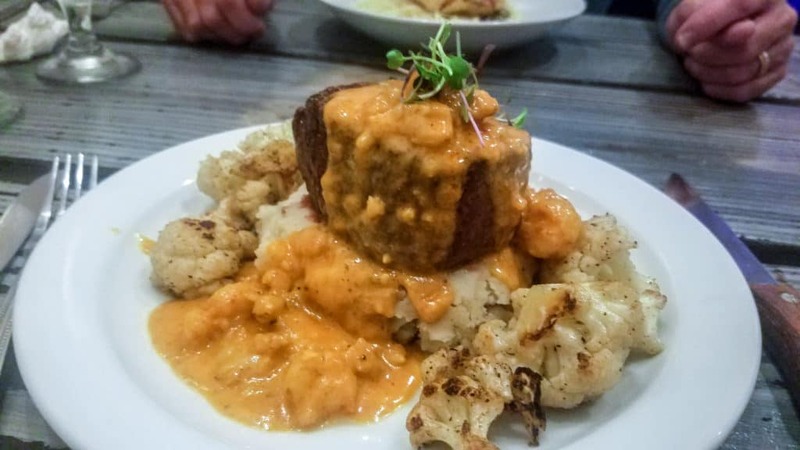 We did have reservations & though they are not necessary, I would recommend considering them if dining at a peak time or if you have a schedule to keep because the seating capacity is approximately 50 … so roughly 12+ tables. There is a separate small area that they can seat a group but maybe a group of 15 max? This is part of the charm & the atmosphere was comfy meets slightly farm-rustic. It is very welcoming … & before our meal is over it has won this GirlChef’s heart! 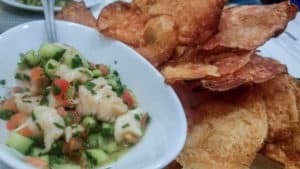 The Ceviche was made with the barrel fish & was everything you want in Ceviche. While at first I wasn’t sure if they would be, the house made potato chips were honestly a perfect accompaniment. We started with the local beer that was on tap. G.R. had the Persimmon Hollow Brewing Co’s Daytona Dirty Blonde (4.1% abv) & I had their Beach Hippie (IPA 7.1% abv). We enjoyed them both. It was fitting that we started with local beer because we knew going in that Millie’s has a passion for all things LOCAL. 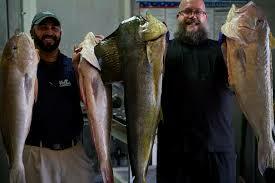 The self-professed Farm (Sea) (River)-to-Table restaurant calls itself “Fresh, Local, Delicious” & it lives up to it! Our server was awesome. Everyone here is professional & attentive & communicative!! All GREAT qualities in a top restaurant. To start the meal we initially wanted the Alligator ribs but were not quite sure …when asked her thoughts, our server guided us to the Ceviche (pictured above) Yep, right choice… next time though ‘gator ribs. G.R. ordered the Local (Barrel) Fish Francaise (barrel fish or pampano were the fish of the day). It was delightful. 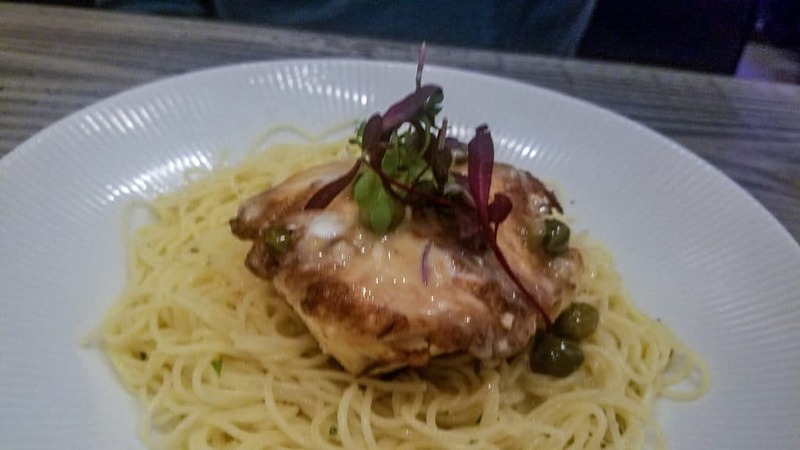 They serve it in picatta-esque style with beautiful plump, briny capers in a lemon buerre blanc. He LOVED it! The owner, Chris Chibarro was out visiting with guests as much as he was interacting with his staff. He didn’t have that ‘air’ that so many managers or owners have who are just walking the floor, gratuitously asking if ‘everything is OK’ & then walking on before you even answer. You’ve had that happen, right? Chris was really talking to people & knew regulars by name. So, when we spoke with him, it was no surprising to hear him say that one of his favorite things about the restaurant is making people happy, He said it brings him joy to just look across the room & see laughter because he knows it means people are enjoying themselves – making memories – & that’s what it’s all about after all! HE IS RIGHT! He gets it & he says it makes a 80 hour work week worth it! I actually believe he means it! He & his wife even recently bought a local fishing magazine (Coastal Angler) – they are IN this community heart & soul! Chris even said the restaurant started delivering close by because there were just too many locals frustrated that all they could get was a pizza if they couldn’t get out! Chris & his wife, Amy, are indeed locals. They opened Millie’s (named after their dog) a year ago with a passion & a clear vision. He said they only live blocks away & he is a former commercial fisherman. He knows his product. 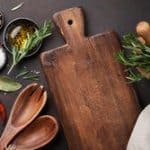 They source all of their ingredients locally & he says that while that may mean too much squash during the fall, his customers are embracing the commitment to locally sourced, sustainable cuisine! Millie’s is not overly fancy, & certainly not pretentious, but they really shine in the details. What it is, is refined, & the clarity of brand here is so refreshing. THIS is what I seek to find in every town across America—> We have the choice as consumers to choose correctly! To finish, we gobbled up the warm birthday brownie (that we had no room for), served with local Cowlick’s Ice Cream, before I realized I hadn’t photographed it. Forgive me! Both were decadent none the less. My only regret leaving was that Chef Jeremy Wimmer was not in the night we visited but maybe next time I can meet him. Bravo on the Menu, Chef! I will leave Millie’s by saying “We shall return Chris, Chef Jeremy & Staff!” It was recommended by a local bartender a few days before & as always, advice from a (local) food service professional didn’t disappoint! THIS is where a Chef wants to eat! If you are ever in the area — GO! 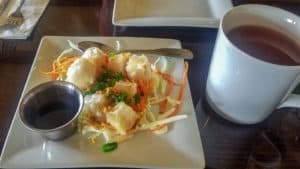 The shrimp dumplings were soft & pillowy & full of flavor served with a ‘just right’ Hoisin style sauce. The hot green Thai tea was delicious. After the Shrimp Dumpling Appetizer, G.R. had Chicken in a Peanut Sauce (heat level 1 of 4)& I had a Beef Stir Fry (heat level 3 of 4). 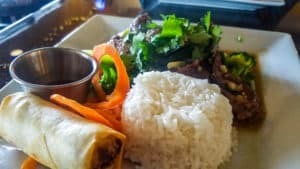 Mine was tender beef with a perfectly spicy (yes, 3 is hot) fresh garlic sauce with crisp but soft broccoli & bright cilantro. Plus, we both received a lovely little fried spring roll with Nuoc Cham dipping sauce! It was just a perfect plate & is available in lunch or dinner size. This was lunch so … lunch size & that was perfect with no leftovers! I smiled all the way through the meal (really). I was just so ‘food happy’. Craving satisfied. The decor at iThai is very nice & clean. The details are not missed. The owner is apparently from Bangkok & I believe the attention to service & quality is a testament to that! It claims to be “An authentic taste of Mexico in Daytona Beach”. We were pointed here by a vendor at the Saturday morning Farmers Market in old downtown Daytona. Once again, a good move on our part for asking a local! Tia’s is family owned & operated. Everyone is friendly & helpful with the menu. You order from the counter but they bring your food out to you & even check in on you. They serve beer & tequila cooladas. It is a homey, friendly taqueria that definitely could be found in Mexico! We ordered Ceviche and the (Mexican style) soft white corn tacos, one of each of the recommended pork, steak & chicken. 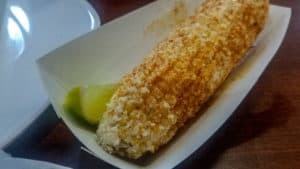 We also took the ‘bait’ & got the suggested cheesy corn on the cob. The corn had butter, a chili powder spice sprinkle & cotija cheese… &it was YUM on a stick (bonus)! 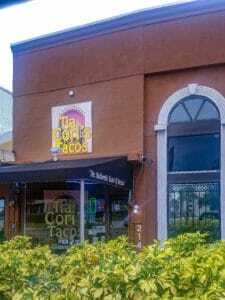 If you want tacos while in Daytona Beach, this is a great choice. 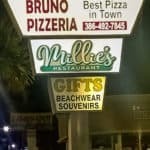 Such a good food in Daytona Beach! My Alex loved tacos (& even did a George Bush impression involving a ‘tacos’ quote) so it’s fitting we ended with Tia Cori’s! Let’s end with a smile & a nod to the gift of life. Happy Birthday to Me! It was a great one & here’s to another 50. Yum! Happy birthday!! Looks like you had a great time! I did …thank you my friend! 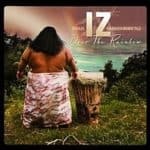 Happy birthday and I also love the song, Somewhere over the Rainbow by IZ, thank you for sharing. Thanks Vicki! So appreciated & glad to have you along!